I woke up this morning and it was raining. Not an unusual sight as Fall is right around the corner, and the days are getting cooler and shorter. What came to mind as I was getting the kids ready for school? This is perfect soup weather. The kind of day that doesn't feel quite right if you don't have a pot of something warm simmering on the stove top. So after the kids were off to school, their little umbrellas over their heads, I took out my stock pot, raided the freezer for some chicken bones to boil and made some stock. Cut up a few veggies, cut the kernels off a few ears of corn leftover in the fridge, shredded some boneless, skinless chicken breasts I had cooked earlier, and voilà! Soup! Uncomplicated, comforting and healthy too. Who wouldn't go for that! This really is the perfect soup to have simmering on the stove on a cold and rainy Fall day. 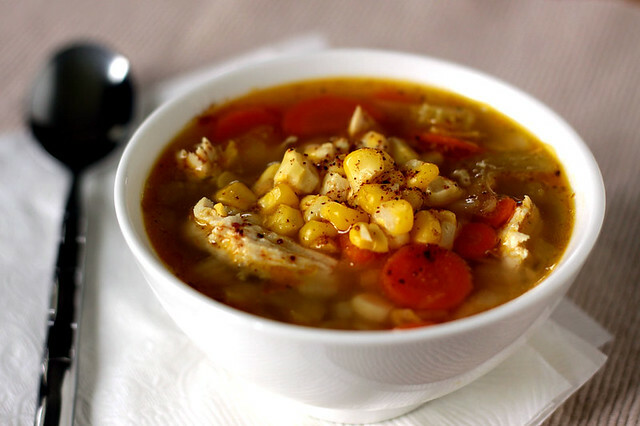 The kick from the smoked chipotle is just enough to give it a little something different from your usual chicken soup. Please feel free to use this recipe as a guide; add more or less of whatever ingredient you like, change the veggies, add some noodles, use smoked paprika in place of the smoked chipotle powder, etc. Soup is great for experimenting! In a large pot, heat the olive oil on medium high heat. Add the celery, carrots and onions and cook until softened, about 10 minutes. Add the garlic powder, smoked chipotle and salt, mix well. Add the chicken stock and bring to a boil. Reduce the heat and simmer for about 15 minutes, until vegetables are cooked. Add the chicken and corn kernels, and simmer until heated through. We are moving over to comfort food season quicker than I had hoped, but nothing is more welcoming than a nice bowl of soup. What a wonderful looking bowl of soup. I could eat chicken soup every day for ever! Nice to see you posting. Your soup looks really good, the fresh corn over here is nasty. Such a comforting soup on a day like today Kay. Yum, this soup looks so delicious! This looks like it would a great comfort food on a cold winter day here in Michigan. I'm a full-time mom of three, with one too many hobbies and a very short attention span. Cooking and baking are my main things, but photography, knitting and drinking wine don't come far behind!